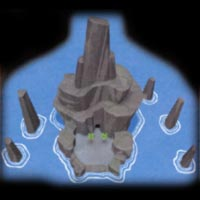 The Wind Temple is the fifth dungeon in The Legend of Zelda: The Wind Waker. Link goes through this dungeon with Makar helping along the way. Link is able to receive the hookshot in this temple after defeating a red wizrobe mini-boss. The Boss of this Temple is Molgera. The Wind Temple was one of two dungeons that Link had to visit to restore power to the Master Sword. There is a long series of tasks to be done before you can even get in to the Wind Temple. In the sector west of The Forest Haven (where the Great Deku Tree lives) there is an island you can't climb onto because it is covered in ice. From your boat, hit the island with the fire arrows you got from the Fairy Queen. You will have five minutes to get onto the island, go inside the cave (in the mouth of the large ice sculpture of a snake) get to the chest, obtain the iron boots, and leave. If your time runs out, you will be launched outside and the island will freeze over again. The Iron Boots make you heavy, and while wearing them, you can't be blown aound by strong winds or air jets. Equip them with , or . Warp to Windfall island, and sail north to a small island with an air jet on the beach. Use the iron boots to walk through the wind to its source, a cracked rock with the Wind Temple symbol and a mouth blowing the air. Destroy it with your Skull Hammer. Inside a large stone, like the one in the Earth Temple will display a song you can conduct with the Wind Waker. Holding the , to play in 6/4 time, . This is the wind God's Aria. The spirit of a Kokiri will appear and introduce himself as Fado, the Sage of Winds. You will conduct the Wind God's Aria and he will play on his violin. Recognize it? It's the second part of the melody from the Title Screen. Fado will tell you to seek out the person who now plays his instrunment. It's the cello that Makar played after you saved him from the Forbidden Woods. Return to your boat and warp to The Forest Haven. Follow the path toward the entrance to the Deku Tree's lair, beating the Boko Babas along the way, until you come to the first bar where you need to use your Grappling hook. Swing out, but don't let go. Press to stop, then holding press to lower yourself to the level of the middle of the waterfall. Then swing into the waterfall and let go to find yourself in a cavern. Another way is to point the wind in the direction where you're going to use your deku leaf to glide in where the musical notes are coming out. Here you will meet Makar. Conduct the Wind God's Aria and he will play it and tell you he has awakened as the sage of Winds. He will ask you to take him to the Wind temple. The cutscene will end with he and you in your boat. Warp to Windfall island and sail north back to where you learned the Wind God's Aria. Makar's ability to plant trees is vital. The fans are switched off. Like the Earth Temple, you need to co-ordinate and make the best use with Makar. You need Makar to unblock the stone slab with the baton. Make use of the deku leaf and iron boots to solve puzzles. This is the hardest of all four dungeons (not counting the Tower of Gods). Simply use the hookshot to pull the snake point to you and slash it. Watch out for his henchsnakes by slashing them. Repeat the process until Molgera finally struck down by the sword. Once you cleared both this temple and the Earth temple, should you decide to get the remaining treasures, go back to the island which is now able to go from day to night but also there's no monsters to be seen. You can do this earlier but this is the safest time to do it. You'll understand after you talk to the King of Red Lions. This page was last edited on 20 April 2014, at 13:23. This page has been accessed 32,862 times.